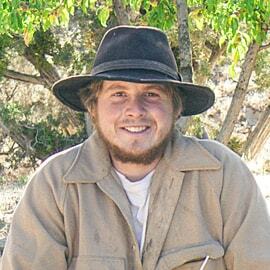 Paul Wachur specializes in nature connection, youth education, and animal husbandry – especially goats. Seeds of these passions sprouted in the great outdoors of rural Massachusetts. Family camping trips and later some visits to the Primitive Skills School proved much more rewarding than conventional schooling where information was dryly fed. Paul found people having fun while learning, and surprised himself one day by spending 14 hours making his own bow. Such passion-driven alternative education led Paul to the Kamana home study journals for nature connection, and quickly to Wilderness Awareness School in Washington state. Here new life skills all combined into what felt like a very foreign but healthy culture. Paul was hooked. After a few long-term programs, Paul was mentoring children at summer camps while learning from amazing mentors well versed in Eight Shields and Coyote Mentoring. Storytelling, facilitating, teaching, and setting expectations were all added to Paul’s tool belt. Paul values teachers and mentors who show up as full individuals sharing their true passions, and feeding the creativity that lives in us all. Today at Quail Springs, Paul aims to be such an educator. When not leading a youth group in a blind-folded drum stalk, Paul can be found (or not found) walking the goat herd or moving the heaviest things that need to get moved. One thing is for sure, he will be doing so calmly, and without any shoes.